I am continually mesmerized by the intricacy of antique filigree. 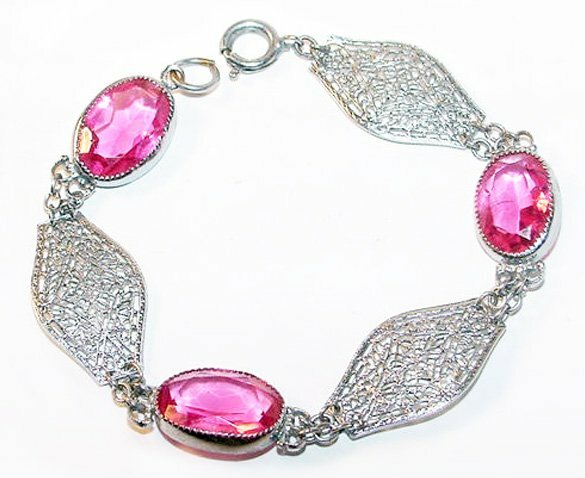 This Art Deco bracelet is a wearable 7 1/4" long. The delicate filigree of each link is designed using floral tracery combined with typical 1930s Art Deco geometric structure. Interspersed large and bright deep pink glass stones, measuring 11 x 17mm, are faceted and collet set. One facet of one stone has a chip. The setting is rhodium plated for lasting beauty.